What Is the Center of Pressure? Home Other Articles Center of Pressure: What Is the Center of Pressure? acting at the center of pressure. The Center of Pressure or CP is the point on an aircraft through which the sum of all of the aerodynamic forces act. It is the total reaction of the individual forces from the wings, tail surfaces and fuselage. 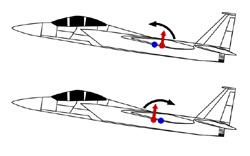 The CP moves with changes in attitude or speed, as the forces change, requiring trimming in level flight. As the angle of attack is increased, the CP moves forward until the ‘critical angle’ of attack is reached, inducing a stall. The CP then moves rapidly aft if the centre of gravity (CG) of the aircraft is positioned ahead of the most aft CP point. If the CG is too far aft and the CP moves ahead of the CG during a stall, the aircraft will suffer an uncontrollable pitching moment. If the CG is too far forward, longitudinal stability is excessive, the stall speed is increased with a reduction of cruise speed.